Chesapeake Harbour is an all-seasons residential condominium community, located in beautiful Annapolis, Maryland on the shores of the Chesapeake Bay. The modern residences, both beachfront townhomes and garden-style condominiums, surround a deep-water marina with direct access to the Bay at the mouth of the Severn River. The Villages of Chesapeake Harbour offer luxurious resort-style Chesapeake Bay living at its very best. Currently, are 9 waterfront homes for sale in Chesapeake Harbour. They range from a 1 bedroom, 1 bath condo for $375,000 to a 3 bedroom, 3 1/2 bath townhome with an elevator for 1,299,000. This weekend there will be 10 waterfront open houses in and around Annapolis. On the list is 219 Wiltshire Lane located in Cape Arthur in Severna Park. This home on Cypress Creek is listed for $1,075,000 and features expansive water views from both levels. Sunny living room. Wonderful lower level family room with wet bar. Convenient, sought after location, close to shopping. Click here for more information. In the past 30 days, 29 new waterfront properties have come on the market in the Annapolis area. The properties for sale range from $375,000 for a 1 bedroom, 1 bath condo in Chesapeake Harbour to $4,475,000 for a 5 bedroom, 6 1/2 bath home in Bluff Point On The Severn. Corrigan’s sense of timelessness is rooted in a worldly vision that balances the one-of-a-kind with precious materials, craftsmanship and a sense of relaxation. His “aristocratic, antiques-layered” style, as Architectural Digest once described it, has caught the attention of celebrities, royalty and global tastemakers. To date, he has completed projects in over 25 countries, including a palatial. Click on image to be directed to his website. 4 bedroom, 4 bath traditional estate for 4,495,000. Click on the above image to view the listings. Currently there are 114 properties in our area for $1M or higher. Property featured above: 803 Coachway in Annapolis, MD, 21401. Breathtaking sunrise views of the Severn River from this beautiful custom home. Over 12,332sqft, exquisitely renovated in 2008. Gourmet chef's kitchen, home theatre, gym, sauna and steamroom. Gorgeous gunite waterside pool with custom inlays and fountains, spa, two outdoor rooms, and gas fireplace make this an entertainer’s dream. Private deep water pier with 3 slips and 2 lifts. Click here for more information. Otherwise, there are a whole lot of other luxurious properties to check out by clicking the link below. There are currently 114 million $ listings on the Annapolis area. Featured is 415 Monterey Avenue in the highly desirable location of West Annapolis. Impeccable home thoughtfully designed & built in 2016 with 300ft of waterfront on Weems Creek. Deepwater, private pier, 7 ft MLW, tram & inground pool, porch & deck. White oak flrs, custom casework, Bluestone hardscape. Chef's kitchen, private office, LL Rec Rm, Gym, 6 BRs & 6.5 BAs. Master suite with fireplace, 2 walk-in closets, marble bath and steam shower. 8076 finished sq. feet. Stunning! In the past 30 days, 27 new waterfront properties have come on the market in the Annapolis area.The properties for sale range from a $375,000 condo in Chesapeake Harbour to $3,550,000 French Provincial in Nantucket on the Severn. 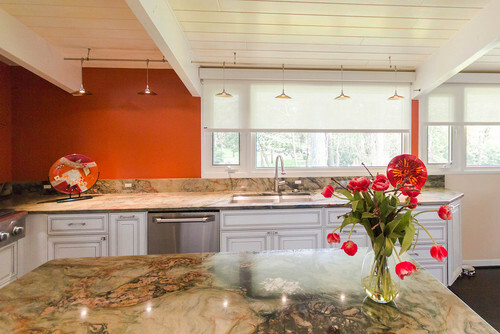 SINCE 1979— Carlos Interiors serves the areas of Crofton, Bowie, Annapolis, Severna Park, and Washington DC with a full line of window treatments, custom fabric window treatments, flooring products, custom re-upholstery services, and everything else for your home design needs.